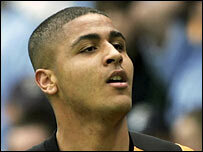 Sheffield Wednesday manager Brian Laws made his first permanent signing of the January transfer window by securing Wolves striker Leon Clarke. The 21-year-old has agreed terms on a two-and-a-half-year contract for an undisclosed fee. "I believe Leon will be a great acquisition to the team, said Laws. "He gives me a different option up front to those that we currently have. That will enable me to change things when required."